Your website is fantastic! It is amazing how much info you have dug up on the Mackays. After reading the info on your website and inspecting the pictures, many memories were triggered. Although I got to see the "pool-tennis courts house" before it was demolished, I never saw the mansion before it was demolished. We used to go camping on the north end of the estate and would explore the ruins of the mansion as a diversion. By the time I was in high school [1953-1957], most of the ruins had been hauled away, leaving only the foundations, gardens and equestrian statues. The statues were located at the opening [west end] of the grand garden which we used as a practice track. If you remember, during 1956-1958, Roslyn High School was undergoing massive reconstruction and for a while we had no track. Mr. Greg Malley, our track coach, would haul us up Harbor Hill to the estate where we would run around the garden which still had its original gravel bed and, as such, was a perfect training track. Mr. Malley deeply admired the statues and was concerned that they would eventually be destroyed by vandals. I suspect that Mr. Malley, being a long-tenured English teacher who was highly respected and admired by the Administration, was quite influential in seeing that one of the two statues was rescued and placed at the entrance to RHS where it now stands (I think). Our cross country running team boasted the most grueling course on the North Shore, if not all of Long Island. The course took you up Harbor Hill, past the site of the mansion, down the north slope, and back up Harbor Hill on the original driveway which we dubbed "Blue Stone". "Blue Stone" was our "Heartbreak Hill" of Boston fame. You either won or lost the race on that stretch. I remember that June day in 1954 when I "discovered" Harbor Hill. The previous month had been a typical, rainy May. All the trees, bushes and weeds were growing in wild profusion. I had to really search for a way to get through the tangle of vegetation along Roslyn Road, just to get off the road and enter the unposted property. Soon, I found an overgrown, double-rutted path half way between the gate lodge and the Long Island Rail Road overpass. No sooner had I gone 20-30 feet from the road, then I came upon the rusting hulk of a big, black sedan. It had seen much better days. The headlight glass was gone. The hood lay on the ground next to the engine compartment. But it was the engine that really caught my eye. It was the largest engine I'd ever seen and at age 13, I thought I knew engines. This one was a huge, straight-eight. The tires were all flat. Both front fenders had big gaping spaces in them where spare tires/wheels once were mounted. The four doors (remember the term suicide doors?) were ajar and inside, the mohair upholstery had become the home for birds nests and other things that had no place in such a once fine automobile. The rear end had an unusual folding rack that at one time held a trunk. What was this car and why was it left here? I found a nameplate. It read, "La Salle". What I had found was a 1934 General Motors, Cadillac-made, La Salle. Here are a few pictures of a restored La Salle, exactly like the one I found on the west edge of the Mackay Estate fifty years ago. Except that "my La Salle" needed the beautiful restoration job seen below. 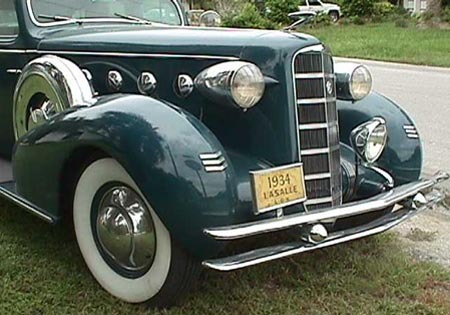 I have since read that La Salles were a favorite type of automobile used by the Mackays in the late 1920s and 1930s. Cars similar to this would have been used to drive hunting party members from Roslyn Station out to the boat dock near Montauk for a trip to Gardiner's Island. I also have been told that Clarence's son, John, found vandalism to the property, after his father's death, to be a continuing problem which he considered to be an embarrassment to the Mackay name. In retrospect, I am sure that this old, pre-war car was considered worthless by the late 1940s and early 1950s and must have been placed on the trail to block easy wheeled access from Roslyn Road onto John Mackay's private property. But this was a memorable car for me!